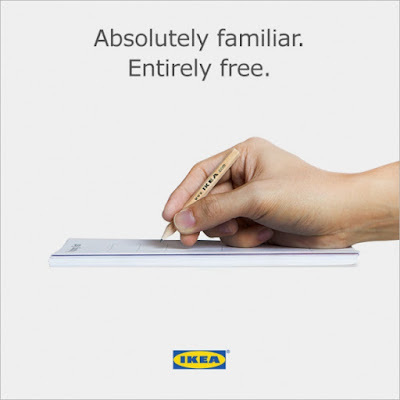 Following their bookbook catalogue tongue-in-cheek ad (see embedded video below), IKEA continues with their humorous jab at Apple after the latter revealed its latest gadget, the Apple Pencil, earlier this week. This is really genius as many of us have already come to know the IKEA pencil to be part of the store experience. There even is a whole Wikipedia entry about these pencils. In fact, a lot of us have probably swiped a few for ourselves when browsing/window shopping there. Which IKEA probably doesn't even care. I must say that when I watched the unveiling of the Apple Pencil, I was really impressed and I can imagine how those who love drawing on their iPads will go out and get one. I know for sure that there are a few apps out there that already have drawn on the iPad technology and have created similar styluses. I wonder, would this encourage more creation and sharing of artwork on social media?